CONNECT READING provides a personalized learning plan for each student, continually developed and refined as students achieve mastery. Each plan is created through an individualized diagnostic that evaluates skills. 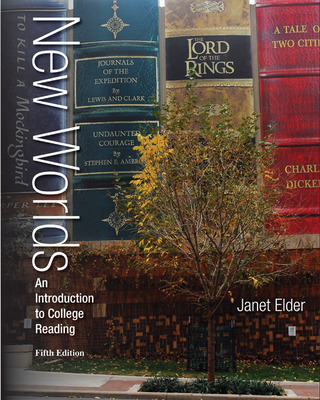 Offered completely online, CONNECT READING can be used in conjunction with NEW WORLDS or OPENING DOORS, which provide a printed experience that teaches critical reading skills through close reading of anthologized chapters. What do you need to know about the reading and studying process? What are the keys to studying college textbooks? What is comprehension monitoring and why is it important? How can you be selective as you read and study? How can you organize as you read and study? How can you rehearse information to remember it? What is the SQ3R study system? How can you adjust your reading rates when you study? How can you improve your reading speed? What do you need to do to be successful in college? How can you find information online? Why is it important to develop a college-level vocabulary? What are context clues and how do you use them? What are word-structure clues and how do you use them? How do you use a dictionary pronunciation key? What is figurative language and how do you interpret figures of speech? Other things to keep in mind when developing your college-level vocabulary. The most common and helpful roots, prefixes, and suffixes in English come from Latin and ancient Greek. Certain punctuation marks in a sentence can signal a definition. What is the topic of a paragraph, and why is it important? What are the clues for determining the topic of a paragraph? You should use a name, word, or phrase, but never a sentence, to express the topic. This means you must know the difference between a phrase and a sentence. A longer passage has an overall topic. What is a stated main idea sentence, and why is it important? What is the method for identifying the stated main idea sentence? Which sentence in a paragraph can be the stated main idea sentence? All stated main idea sentences have certain characteristics in common. Signal words or phrases can help you locate a stated main idea and locate a stated main idea that is presented as a conclusion. A longer passage often has an overall main idea that is stated, too. What is an implied main idea, and why is it important? You must always use a sentence—not just a phrase—to express a formulated main idea. This means you must know the difference between a sentence and a phrase. All formulated (implied) main idea sentences have certain characteristics. A longer passage often has an implied overall main idea that you must formulate, too. What are supporting details, and why are they important? What is the method for identifying supporting details? Watch for clues that indicate a list of details. Avoid overmarking your textbook by numbering the supporting details in a paragraph rather than highlighting or underlining them. Listing the details on separate lines in your study notes or on review cards can help you learn the information more efficiently. What are authors' writing patterns and why are they important? Lists and sequences differ in an important way. Avoid identifying every paragraph as having a list pattern. Authors often mix patterns in the same paragraph. A longer selection may contain several patterns and have an overall pattern as well. What is critical reading, and why is it important? What is author’s point of view, and how can you determine it? What is author’s purpose, and how can you determine it? What is author’s intended audience, and how can you determine it? What is author's tone and how can you determine it? You should avoid seeing the purpose of everything you read as to inform. If the author’s purpose is to persuade you to adopt his or her point of view, you should determine which side of an issue he or she favors. Understanding the author’s tone will enable you to grasp the true or intended meaning, even when the author’s words may appear to be saying something different. There are two forms of irony: irony in tone and irony in situations. Sarcasm and irony are not the same thing. What is thinking critically, and why is it important? What are facts and opinions, and why is it important to be able to distinguish between them? What are inferences, and why is it important to make them? Facts and opinions may or may not appear together. Authors sometimes present opinions in such a way that they appear to be facts. There are other critical thinking skills, such as recognizing propaganda devices and recognizing fallacies, that can also be used to evaluate written material. What is the three-step process for studying college textbooks? How can you interpret visuals and graphic aids? How can you interpret visual aids? How can you interpret graphic aids? Other things to keep in mind when studying textbook material. 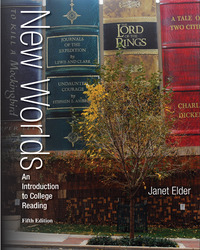 You will benefit from examining the features in all of your textbooks at the beginning of the semester. How are rehearsal and memory related? How can you underline, highlight, and annotate your textbooks? How can you take notes from textbooks? When you study, choose the study techniques (underlining, highlighting, annotating, outlining, mapping, summarizing, making review cards or test review sheets) that (a) are appropriate to the type of material you are studying, (b) correspond with how you will e tested on the material, and (c) best suit your learning style. Learn how to handle outline, summary, and mapped notes questions on standardized reading tests.